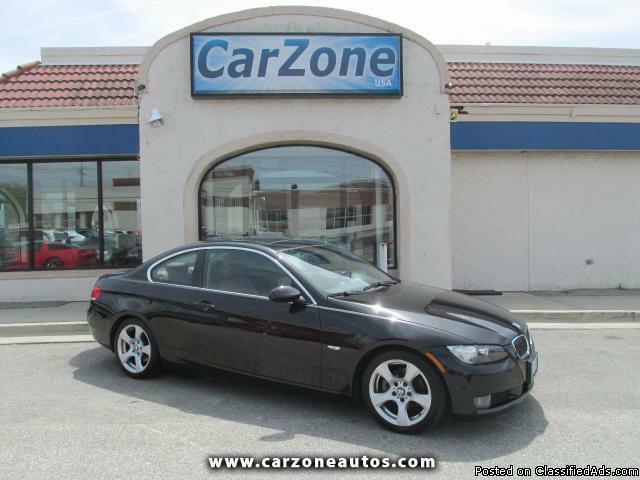 xxxx BMW 328i COUPE | Jet Black with Burnt Orange Leather Seats | The xxxx BMW 3-Series is an award-winning car! Car and Driver gave the 3-Series one of its 10 Best Car awards for xxxx, further claiming that "constant upgrades have kept the 3-series on our 10 Best list for a record 16 consecutive years." Edmund's named it "Most Wanted Sedan under $35,000" and Consumer Guide calls it a "Best Buy." The 3-Series also won the "World Car of the Year" award at the xxxx New York Auto Show. The Washington Post sums it up well when it says that the xxxx 3-Series offers "ride and handling so smooth, so wonderfully responsive, you wind up driving the car for the sheer joy of driving it. Destination becomes a secondary concern." Equipped with stand-out burnt orange leather seats, power folding mirrors, sunroof, woodgrain trim, power rear seat easy entry, push start ignition, rain sensing windshield wipers, homelink, SOS Communications, dual automatic climate controls, bluetooth, auxiliary Mp3 input, voice entry system, and even a beverage cooler- the BMW 328i is sporty, luxurious, and offers top of the line build quality!